Jim Pace's "The Web" will out impact any other effect in your repertoire. For those that want to go for the jugular and take no prisoners, the Web gets a more visceral reaction than any card effect ever created! In fact, there are some people you simply should NOT do this effect for because it starts out so innocently, yet ends with such a startling reaction! The Effect: This makes 'em jump up and scream! Four blank cards are counted onto the spectator's palm up hand. 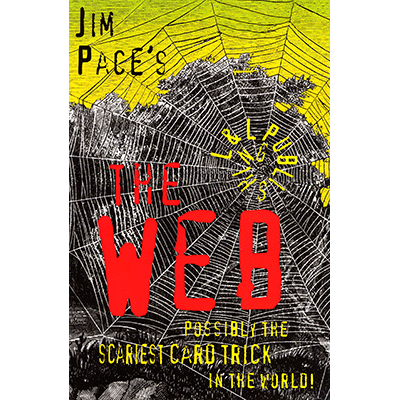 Then pictures of spider webs appear and disappear from the faces of the cards. To conclude, the spectator is asked to wave his hands over the cards. As he does, he discovers a large, realistic spider on the back of his hand. The spider is undetectable, and you are way ahead! At the right time, in the right place, this receives an unprecedented response! - you will make people scream!